To overcome these challenges, Hyster offers a solution for marble handling industry applications which features the Pars Express 5 marble attachment, a special bundle attachment, in combination with a tough Hyster forklift truck. Applications commonly opt for either the H5.5FT diesel forklift, or the Hyster J5.5XN electric lift truck, depending on the needs of their operation. Both provide excellent visibility and control when handling challenging loads, helping to improve accuracy and reduce damage. As well as reducing damage, using a tough Hyster lift truck benefits operational efficiency. Loading and unloading of shipments can be achieved at greater speed, as it is not necessary to depend on a crane, or to wait for one to become available. In addition, the marble can be stored in locations where a crane is not present, providing applications with more ways to maximise their existing infrastructure. Flexibility is also achieved as the same tough truck can be used in many different applications throughout the marble supply chain, from production plants, stores and showrooms, to ports and rail yards. With a robust chassis and strong mast design, Hyster lift trucks optimise residual capacity when working with attachments, while also offering good visibility and rigidity. The versatile lift truck also supports a variety of handling activities. 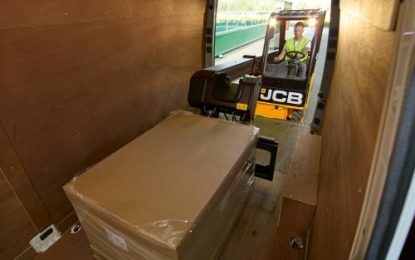 Stacking the marble slabs, transporting them within a storage area, and loading and unloading containers can all be achieved with a Hyster lift truck and the specialist marble attachment.